I suppose that vanity has been my friend since childhood. I don’t necessarily remember the start of our relationship, but I’m told countless stories about how, in spite of my crippling shyness, I would visit my neighbors in Puerto Rico in whatever new dress or outfit I had at the moment, simply to tell them “Me veo bonita” (I look pretty), a statement, not a question. While in my youth, she, Vanity, seemed to help me maintain a high level of self-esteem, but the years that followed only made for a dysfunctional relationship. The truth is that she was what we, now, call a frenemy. The kind of friend who only makes you feel good if you can achieve and maintain a certain standard of physical beauty. If you cannot or do not, well to hell with you. Many years later, older, wiser, and seriously tired of trying to keep up, I decided to turn the tables and said, “No! 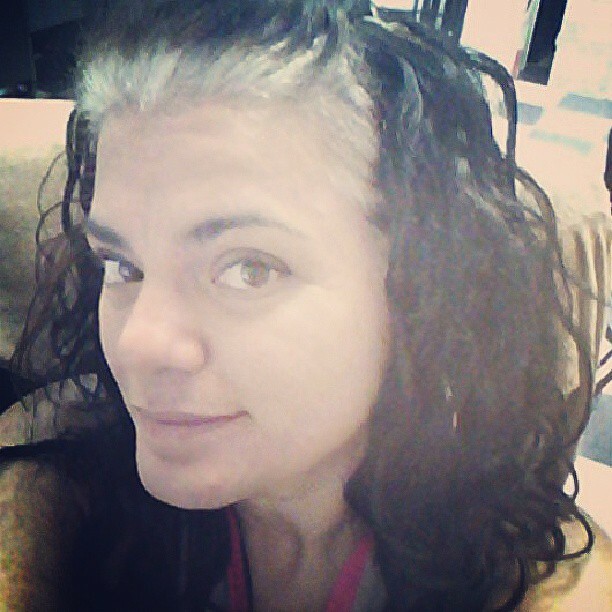 The hell with YOU!” and thought it a great idea to grow out my silver hair, try the no-poo and curly girl method all at once. I felt so determined a month ago, but the truth is, there’s a certain comfort in a lifelong friendship that’s difficult to let go, even with the most toxic of friends. This is not easy. There’s a transition period to go through that, in many ways, for me, has mirror the stages of grief, but rather than experience them in some order, they’ve hit all at once. Thankfully, I’ve also received compliments on the beauty of the silver color growing in, and I have to admit that I think the natural silver color is beautiful. Words and thoughts that help me ignore the negative. In a year, or maybe less considering how fast my hair grows, I will be in love with it. As for the no poo, that’s been difficult too, and for now, I decided to co-wash instead (washing with only conditioner, great info here) since all the years of chemicals and heat from flat irons had done so much damage. My curls weren’t cooperating, but yesterday I discovered a method called plopping or plunking (great how-to graphic here) and I tried it last night and woke up to some amazing results. I was so happy that I had to share a photo. As I sat early this morning trying to take a selfie that would both show the gray growth and the bounce of my curls, I realized that I didn’t breakup with Vanity at all, there’s just too much history there, and maybe the most I can hope for is that our relationship can change to one that is a little more balanced. Previous postTo go gray or not to…wait, what is the question? Thank you, and what a compliment, cause she’s a doll!